Our second Christmas day was much more relaxed than that of my brother- and sister-in-law. We only had one family dinner to attend at a restaurant, whereas they had more events to attend as they had on both days prior. Yet another advantage we get by having our families on different continents! Okay, in all seriousness it would be awesome to be able to see both families for Christmas, but I guess we wouldn’t appreciate the uniqueness of the life we chose as much as we do if it didn’t come at a cost. We originally had plans for the early afternoon, but they fell through so we did absolutely nothing except coffee and crossword. That evening though was the last of our Christmas dinners, with my wife’s uncle and his family which included his wife, two sons, and the older son’s girlfriend. That was also our only chance to see them as they live in Darmstadt and not Trier. The interesting part about this visit/dinner though is that we talk to the younger of the two brothers via WhatsApp constantly as he is a huge football fan and just so happens to be in our fantasy football league, but rarely get to talk to him in person. He is trying to plan a visit to Boise, but planning around a University schedule and for football season is not particularly easy. He was twice as pleased to see us though as we just happened to be bringing him an NFL jersey and beanie, plus the mini helmet we surprised him with for Christmas. Since he follows my ramblings, here is a little shout out. We arrived at the Brauhaus for dinner approximately 5 minutes prior to the time of our reservation, which the ultimate German standard for punctuality, to find the Darmstädter also arriving. Suprisingly though our table was still occupied so we took a seat at the bar to have beer while we waited. It was here that I learned that the older of the Darmstadt brothers is also a reader of this very blog and routinely fills the whole family in on the goings on here at Germerican Denglish. That was very cool to hear and I felt honored, but at the same time it was weird to hear. Why it is cool or complimentary to hear requires no explanation, but let me tell you why it’s weird. As a small time blogger, I always assume that most everybody who reads my blog are either strangers or my wife. Not that my WordPress followers are total strangers mind you as I follow and have exchanged comments with many of them, but I have never met any of them in person. But when you blog with the assumption that everyone reading your ramblings know nothing about you except what you choose to share. It is very anonymous, which I obviously do my best to stay. So when I heard that they follow me closely it was odd. Not bad, just odd. Once we got to the table and completed a minor gift exchange it was finally time to eat. Now knowing that they all follow along with me it was not a particular surprise, but it was amusing to see every single one of the Darmstädter order the very same schnitzel that I had on Christmas Vacation Day 1. 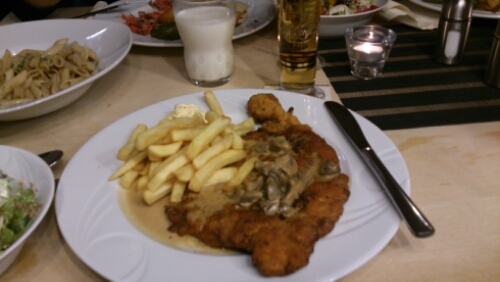 We all proceeded to enjoy our schnitzel, as well as our beer, for a few hours and had a very enjoyable evening. Like all good things though, this too had to come to an end as Darmstadt is a two hour drive and nobody wants to be driving home in the middle of the night. After we got the little one in bed my wife, father-in-law, and I finished our evening off in the living room, a great way to finish Germany’s three Christmas days. Bis zum nächsten mal!